Using data on individual workers from January to December 2015, this report estimates the wage differential between the government and private sectors in Quebec. It also evaluates four available non-wage benefits in an attempt to quantify compensation differences between the two sectors. After controlling for such factors as gender, age, marital status, education, tenure, size of firm, type of job, industry, and occupation, Quebec’s government sector workers (from the federal, provincial, and local governments) were found to enjoy a 9.1 percent wage premium, on average, over their private sector counterparts in 2015. When unionization status is factored into the analysis, the wage premium for the government sector declines to 5.5 percent. The available data on non-wage benefits suggest that the government sector enjoys an advantage over the private sector. For example, 89.3 percent of government workers in Canada are covered by a registered pension plan, compared to 23.8 percent of private sector workers. 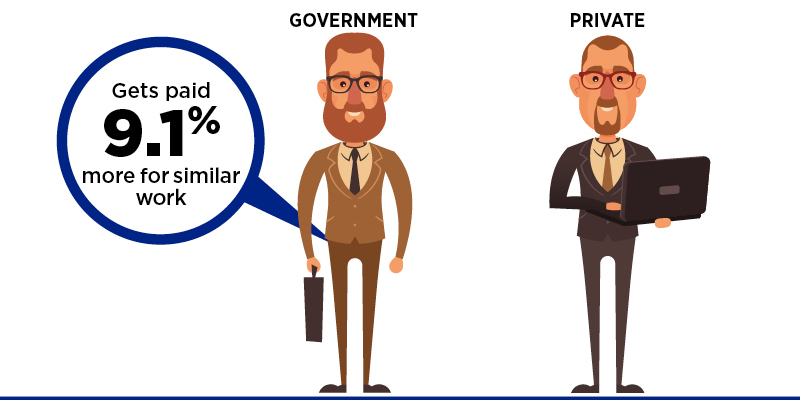 Of those covered by a registered pension plan in Quebec, 96.9 percent of government workers enjoyed a defined benefit pension compared to just over half (57.9 percent) of private sector workers. In addition, government workers retire earlier than their private sector counterparts—about 2.8 years on average—and are much less likely to lose their jobs (4.5 percent in the private sector versus 0.6 percent in the public sector). Moreover, full-time workers in the government sector lost more work time in 2015 for personal reasons (16.5 days on average) than their private sector counterparts (9.6 days).